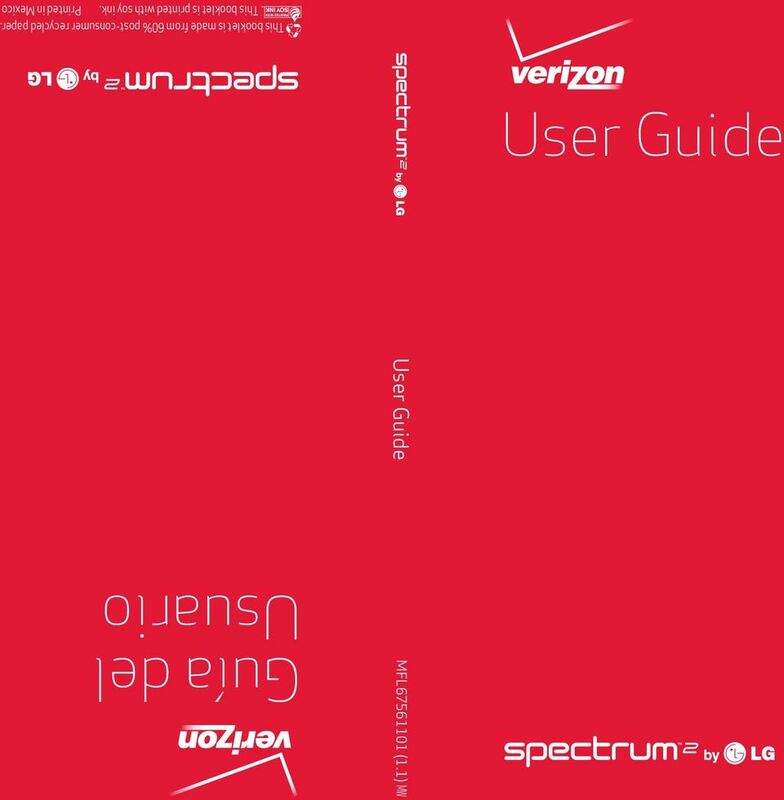 Download "User Guide. Usuario. User Guide MFL67561101 (1.1) MW. This booklet is printed with soy ink. Printed in Mexico"
2 Copyright 2012 LG Electronics, Inc. All rights reserved. LG and the LG logo are registered trademarks of LG Group and its related entities. Spectrum is a trademark of LG Electronics, Inc. All other trademarks are the property of their respective owners. 3 Important Customer Information 1 Before you read Before getting started, please review the separate Product Safety and Warranty Information guide for important product safety and warranty information about your device. 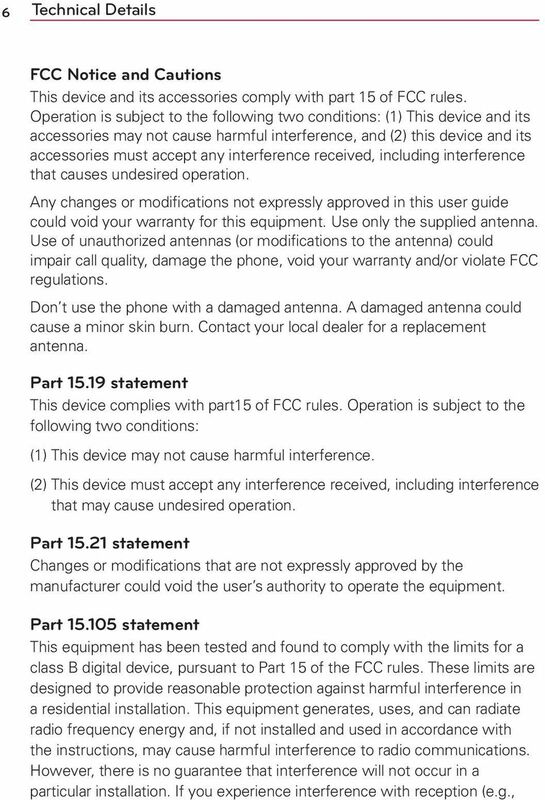 9 Technical Details 7 television), determine if this equipment is causing the harmful interference by turning the equipment off and then back on to see if the interference is affected. If necessary, try correcting the interference by one or more of the following measures: - Reorient or relocate the receiving antenna. - Increase the separation between the equipment and receiver. - Connect the equipment into an outlet on a circuit different from that to which the receiver is connected. - Consult the dealer or an experienced radio/tv technician for help. The phone operates on Verizon s 4G network, based on Long Term Evolution (LTE) technology and Mobile Broadband 4G networks in the United States*. Now you can connect easily at high speeds to the Internet, your corporate Intranet, and your while you re away from the office. Cautions * Service not available everywhere. 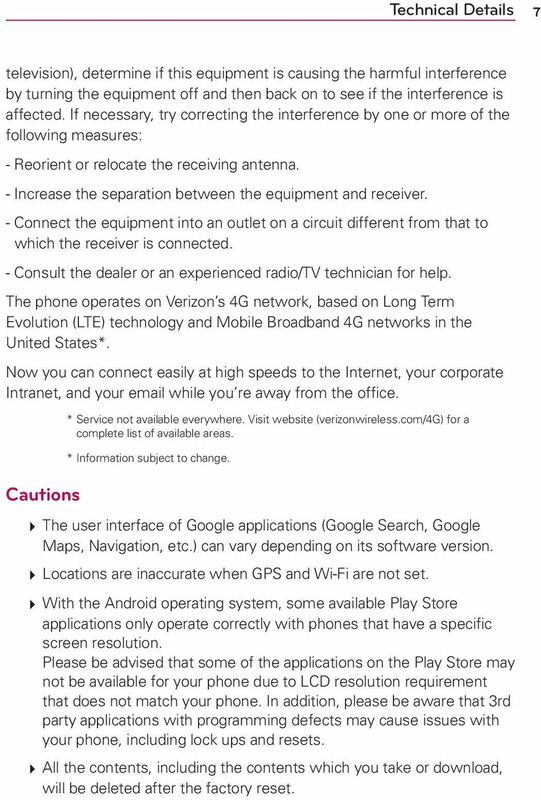 Visit website (verizonwireless.com/4g) for a complete list of available areas. * Information subject to change. The user interface of Google applications (Google Search, Google Maps, Navigation, etc.) can vary depending on its software version. Locations are inaccurate when GPS and Wi-Fi are not set. With the Android operating system, some available Play Store applications only operate correctly with phones that have a specific screen resolution. Please be advised that some of the applications on the Play Store may not be available for your phone due to LCD resolution requirement that does not match your phone. In addition, please be aware that 3rd party applications with programming defects may cause issues with your phone, including lock ups and resets. All the contents, including the contents which you take or download, will be deleted after the factory reset. 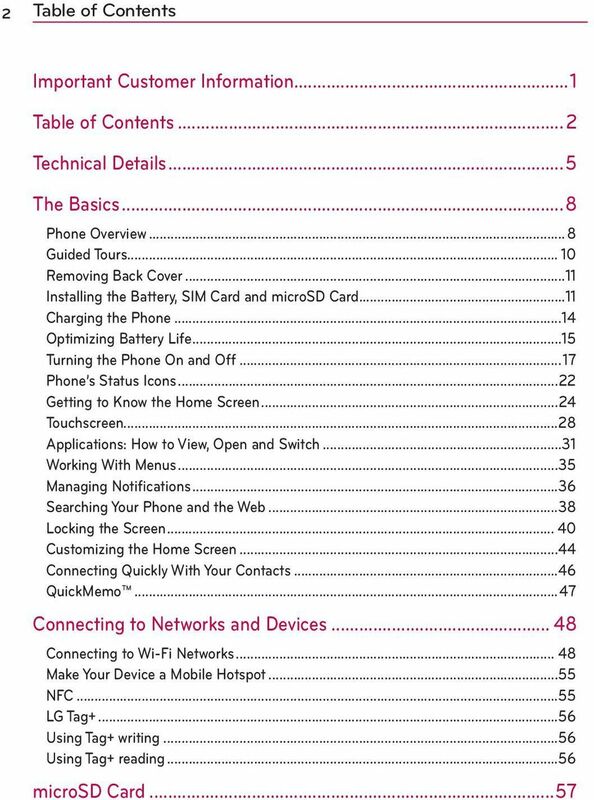 10 8 The Basics Phone Overview Front View Earpiece Proximity Sensor Front Camera Lens Home Screen Back Key Home Key Menu Key Recent Apps Key Microphone NOTES All screen shots in this guide are simulated. Actual displays may vary. Tap Apps then tap Guided Tours to access the brief & full device guides, video tutorials, and icon glossary. You can get information in detail right from your phone. 1. Earpiece Lets you hear callers and automated prompts. 2. Back Key Returns to the previous screen. Also closes pop-up display items, such as menus, dialog boxes, and the on-screen keyboard. 3. Home Key Returns to the Home screen. If you re already viewing one of the Home screen extension canvases, it navigates you to the central Home screen canvas. 4. Microphone Transmits your voice to the other caller and is used for voice-activated functions. 5. Recent Apps Key Opens the list of recently used applications. 6. Menu Key Opens an options menu with options that affect the current screen of app. This only applies when available, depending on the screen or app. 7. Home Screen Displays all of the information needed to operate your phone, such as applications, call status, date, time, signal status, and battery strength. 11 The Basics 9 8. Front Camera Lens Use for taking pictures and recording videos of yourself. You can also use this for video chatting. Keep it clean for optimal performance. 9. Proximity Sensor Senses proximity toward other objects (such as your head) so that tap commands are not accidentally activated during a call. It also employs an ambient sensor which measures the surrounding light and adjusts the LCD brightness to provide a vivid screen. NOTES Do not block the sensor or near the sensor to avoid problems with the tap operations. The use of a film cover produced by manufacturers other than LG can cause a disturbance in tap operations, the display, etc. Rear View LED Flash Rear Camera Lens NFC touchpoint Wireless Charging Battery Cover Speaker 10. LED Flash Brightens up the captured image or recorded video when you turn on the flash. 11. NFC touchpoint Tap the back of your phone to an NFC tag or another NFC compatible device in this location. 12. Speaker Sound comes from the rear speaker instead of the earpiece (e.g., the speakerphone function, music player function, etc.). 13. Wireless Charging Battery Cover Encloses the battery compartment. 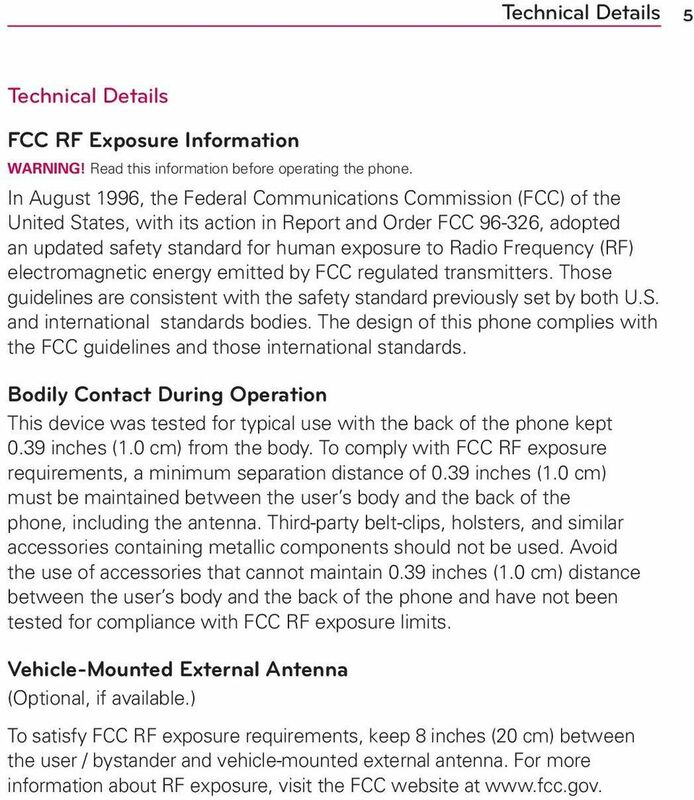 Also, the antenna is located inside the back of the phone. 14. Rear Camera Lens Use for taking pictures and recording videos. Keep it clean for optimal performance. 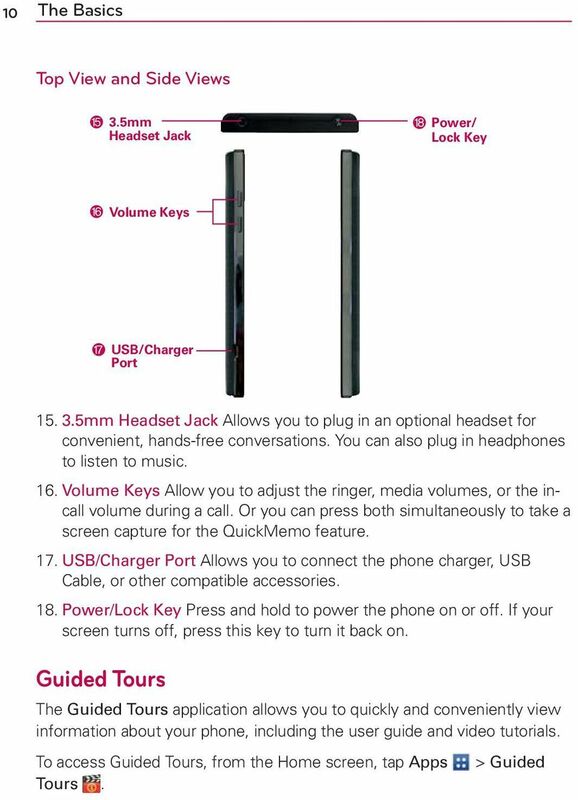 12 10 The Basics Top View and Side Views 3.5mm Headset Jack Power/ Lock Key Volume Keys USB/Charger Port mm Headset Jack Allows you to plug in an optional headset for convenient, hands-free conversations. You can also plug in headphones to listen to music. 16. 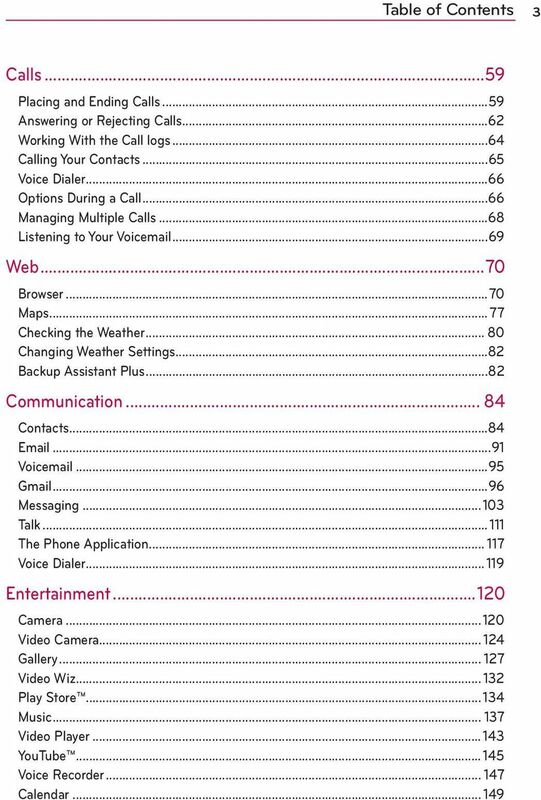 Volume Keys Allow you to adjust the ringer, media volumes, or the incall volume during a call. Or you can press both simultaneously to take a screen capture for the QuickMemo feature. 17. USB/Charger Port Allows you to connect the phone charger, USB Cable, or other compatible accessories. 18. Power/Lock Key Press and hold to power the phone on or off. If your screen turns off, press this key to turn it back on. Guided Tours The Guided Tours application allows you to quickly and conveniently view information about your phone, including the user guide and video tutorials. To access Guided Tours, from the Home screen, tap Apps > Guided Tours. 13 The Basics 11 Removing Back Cover Insert your fingertip under the ledge at the bottom of the phone and gently lift back the cover to remove. The back cover is compatible with a wireless charging pad (sold separately) which allows you to charge your device wirelessly. * To purchase a wireless charging pad, please visit vzw.com/chargewithoutwires or a Verizon Wireless retail store. Installing the Battery, SIM Card and microsd Card NOTE It is important to fully charge the battery before initial use of the phone. WARNING! Your device includes a heat sensor activated by the battery temperature. 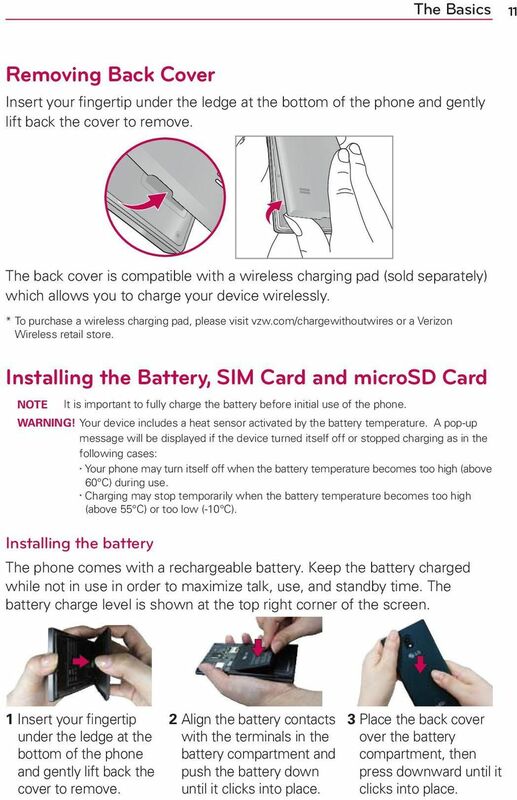 A pop-up message will be displayed if the device turned itself off or stopped charging as in the following cases: Your phone may turn itself off when the battery temperature becomes too high (above 60 C) during use. Charging may stop temporarily when the battery temperature becomes too high Installing the battery (above 55 C) or too low (-10 C). The phone comes with a rechargeable battery. Keep the battery charged while not in use in order to maximize talk, use, and standby time. The battery charge level is shown at the top right corner of the screen. 1 Insert your fingertip under the ledge at the bottom of the phone and gently lift back the cover to remove. 2 Align the battery contacts with the terminals in the battery compartment and push the battery down until it clicks into place. 3 Place the back cover over the battery compartment, then press downward until it clicks into place. 14 12 The Basics Removing the battery 1. Turn the phone off and insert your fingertip under the ledge at the bottom of the phone and gently lift back the cover to remove. 2. Use the fingertip cutout at the bottom of the battery compartment to lift the battery out. NOTE Be careful not to scratch or damage the inside of the back cover as this is where the antenna is located. Installing a SIM card NOTE If not already inserted, follow the instructions below to install your SIM Card. Turn the power off. Remove the back cover and the battery (as demonstrated in the previous instructions). Locate the SIM card slot (a SIM card graphic is inscribed on the left side of the slot). 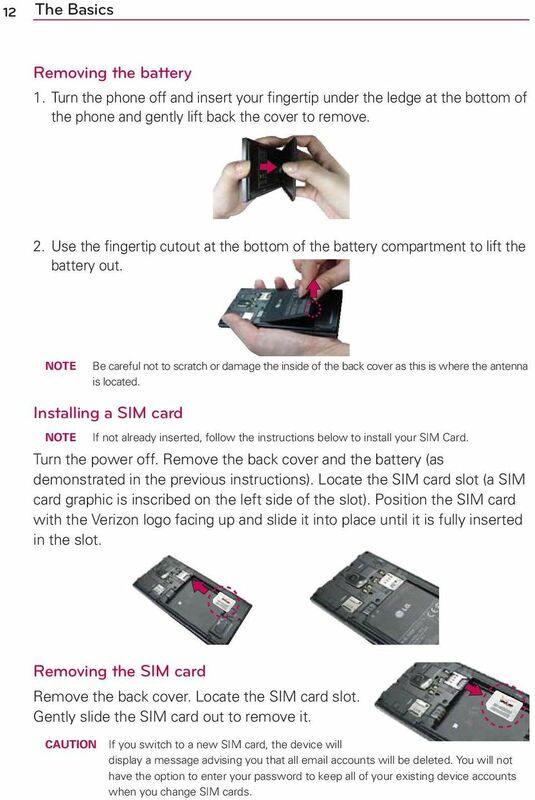 Position the SIM card with the Verizon logo facing up and slide it into place until it is fully inserted in the slot. Removing the SIM card Remove the back cover. Locate the SIM card slot. Gently slide the SIM card out to remove it. CAUTION If you switch to a new SIM card, the device will display a message advising you that all accounts will be deleted. You will not have the option to enter your password to keep all of your existing device accounts when you change SIM cards. 15 The Basics 13 Inserting a microsd card NOTE The microsd card is sold separately. 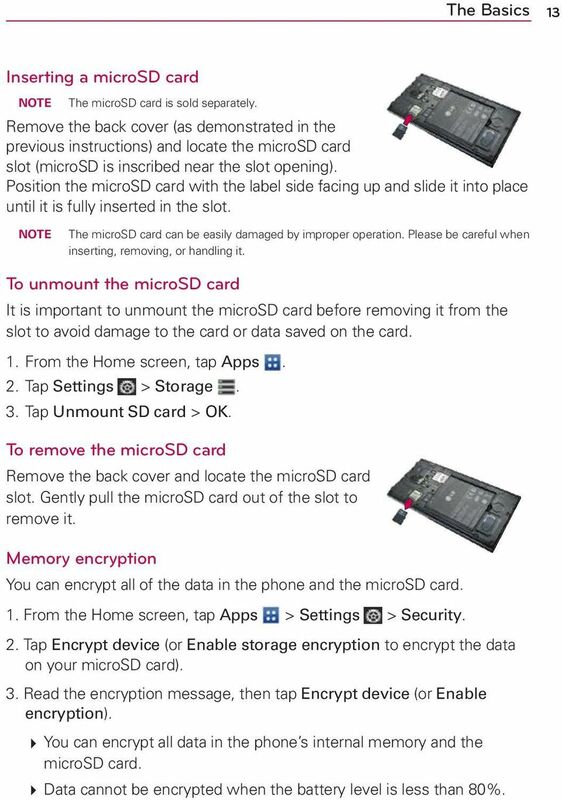 Remove the back cover (as demonstrated in the previous instructions) and locate the microsd card slot (microsd is inscribed near the slot opening). Position the microsd card with the label side facing up and slide it into place until it is fully inserted in the slot. NOTE The microsd card can be easily damaged by improper operation. Please be careful when inserting, removing, or handling it. To unmount the microsd card It is important to unmount the microsd card before removing it from the slot to avoid damage to the card or data saved on the card. 1. From the Home screen, tap Apps. 2. Tap Settings > Storage. 3. Tap Unmount SD card > OK. To remove the microsd card Remove the back cover and locate the microsd card slot. Gently pull the microsd card out of the slot to remove it. Memory encryption You can encrypt all of the data in the phone and the microsd card. 1. From the Home screen, tap Apps > Settings > Security. 2. Tap Encrypt device (or Enable storage encryption to encrypt the data on your microsd card). 3. Read the encryption message, then tap Encrypt device (or Enable encryption). You can encrypt all data in the phone s internal memory and the microsd card. Data cannot be encrypted when the battery level is less than 80%. 16 14 The Basics While encrypting, you cannot access other functions. Do not connect the USB Cable while encrypting. Do not take out the microsd card while encrypting. Do not take out the battery while encrypting. Do not press the Power/Lock Key while encrypting. While encrypting the phone, your phone will reboot several times. If you encode the microsd card then perform a factory reset, you cannot access encrypted data in the microsd card. 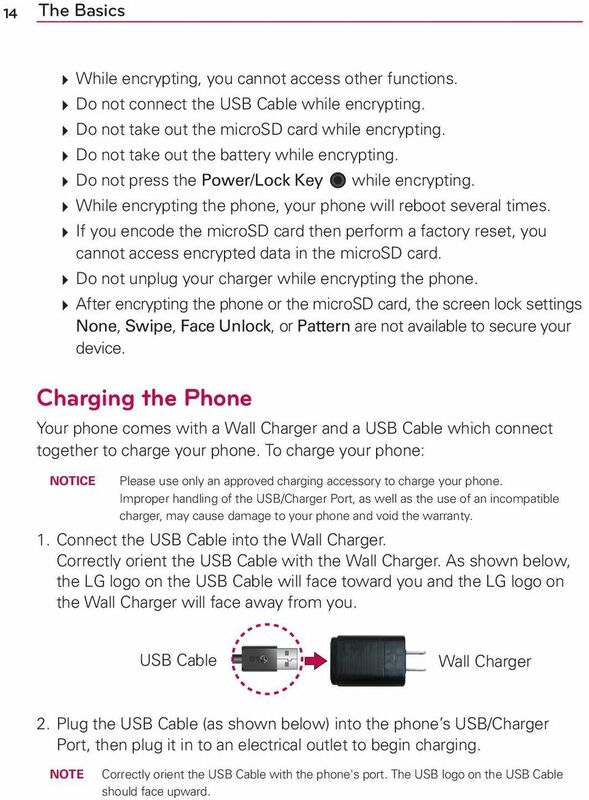 Do not unplug your charger while encrypting the phone. After encrypting the phone or the microsd card, the screen lock settings None, Swipe, Face Unlock, or Pattern are not available to secure your device. Charging the Phone Your phone comes with a Wall Charger and a USB Cable which connect together to charge your phone. To charge your phone: NOTICE Please use only an approved charging accessory to charge your phone. Improper handling of the USB/Charger Port, as well as the use of an incompatible charger, may cause damage to your phone and void the warranty. 1. Connect the USB Cable into the Wall Charger. Correctly orient the USB Cable with the Wall Charger. As shown below, the LG logo on the USB Cable will face toward you and the LG logo on the Wall Charger will face away from you. USB Cable Wall Charger 2. Plug the USB Cable (as shown below) into the phone s USB/Charger Port, then plug it in to an electrical outlet to begin charging. NOTE Correctly orient the USB Cable with the phone's port. The USB logo on the USB Cable should face upward. 17 The Basics 15 Charging with the USB Cable You can use your computer to charge your phone. 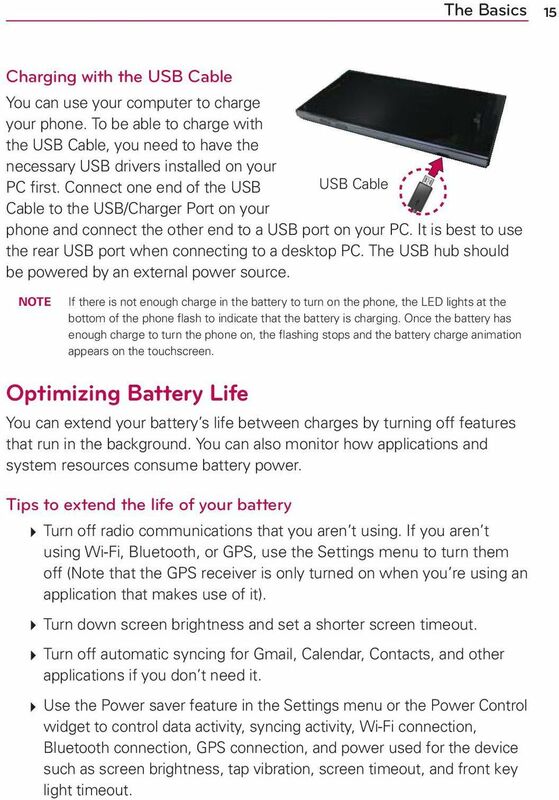 To be able to charge with the USB Cable, you need to have the necessary USB drivers installed on your PC first. Connect one end of the USB USB Cable Cable to the USB/Charger Port on your phone and connect the other end to a USB port on your PC. It is best to use the rear USB port when connecting to a desktop PC. The USB hub should be powered by an external power source. 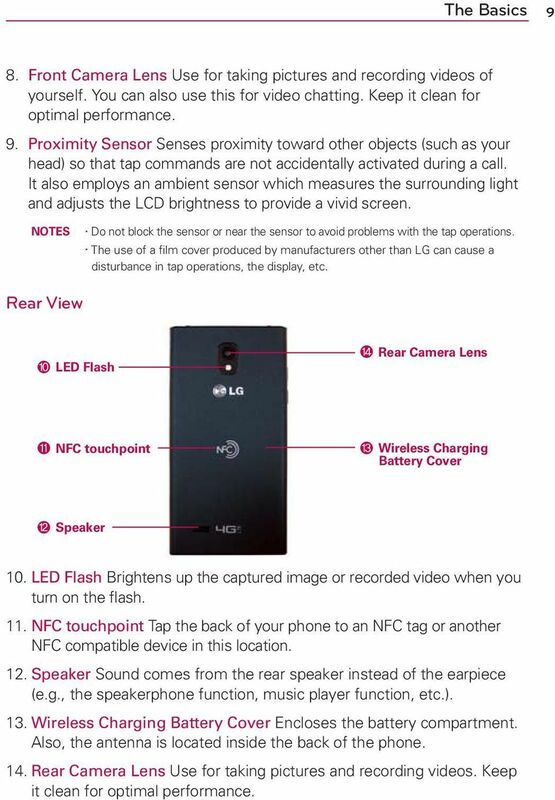 NOTE If there is not enough charge in the battery to turn on the phone, the LED lights at the bottom of the phone flash to indicate that the battery is charging. Once the battery has enough charge to turn the phone on, the flashing stops and the battery charge animation appears on the touchscreen. Optimizing Battery Life You can extend your battery s life between charges by turning off features that run in the background. You can also monitor how applications and system resources consume battery power. Tips to extend the life of your battery Turn off radio communications that you aren t using. If you aren t using Wi-Fi, Bluetooth, or GPS, use the Settings menu to turn them off (Note that the GPS receiver is only turned on when you re using an application that makes use of it). Turn down screen brightness and set a shorter screen timeout. Turn off automatic syncing for Gmail, Calendar, Contacts, and other applications if you don t need it. 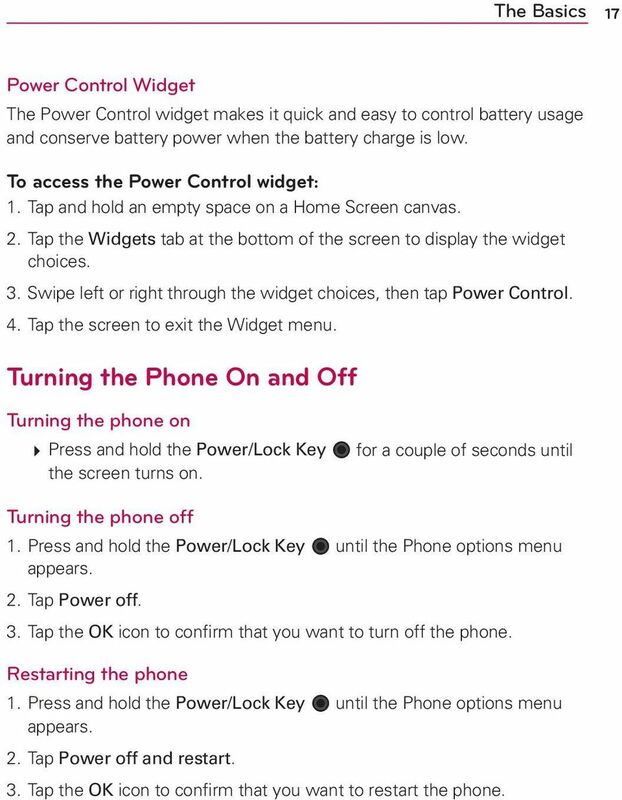 Use the Power saver feature in the Settings menu or the Power Control widget to control data activity, syncing activity, Wi-Fi connection, Bluetooth connection, GPS connection, and power used for the device such as screen brightness, tap vibration, screen timeout, and front key light timeout. 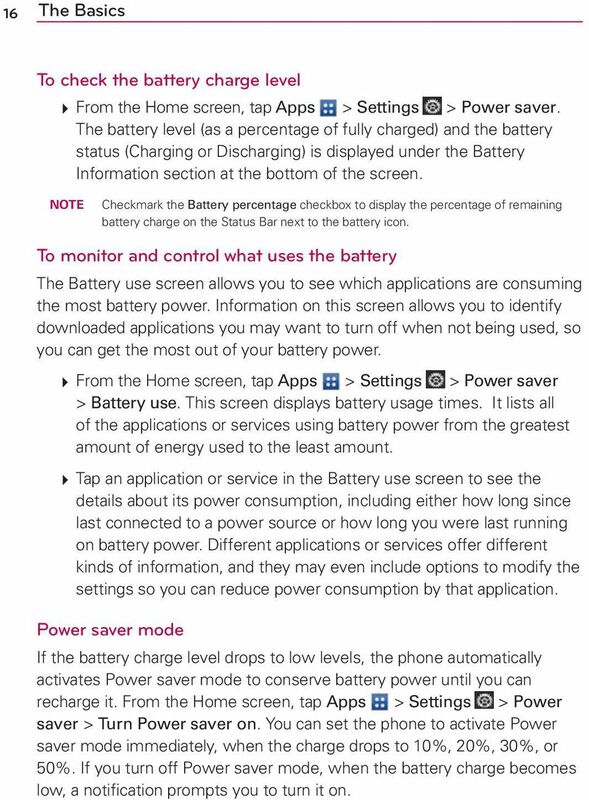 18 16 The Basics To check the battery charge level From the Home screen, tap Apps > Settings > Power saver. The battery level (as a percentage of fully charged) and the battery status (Charging or Discharging) is displayed under the Battery Information section at the bottom of the screen. NOTE Checkmark the Battery percentage checkbox to display the percentage of remaining battery charge on the Status Bar next to the battery icon. To monitor and control what uses the battery The Battery use screen allows you to see which applications are consuming the most battery power. Information on this screen allows you to identify downloaded applications you may want to turn off when not being used, so you can get the most out of your battery power. From the Home screen, tap Apps > Settings > Power saver > Battery use. This screen displays battery usage times. It lists all of the applications or services using battery power from the greatest amount of energy used to the least amount. Tap an application or service in the Battery use screen to see the details about its power consumption, including either how long since last connected to a power source or how long you were last running on battery power. Different applications or services offer different kinds of information, and they may even include options to modify the settings so you can reduce power consumption by that application. Power saver mode If the battery charge level drops to low levels, the phone automatically activates Power saver mode to conserve battery power until you can recharge it. From the Home screen, tap Apps > Settings > Power saver > Turn Power saver on. You can set the phone to activate Power saver mode immediately, when the charge drops to 10%, 20%, 30%, or 50%. If you turn off Power saver mode, when the battery charge becomes low, a notification prompts you to turn it on. 19 The Basics 17 Power Control Widget The Power Control widget makes it quick and easy to control battery usage and conserve battery power when the battery charge is low. To access the Power Control widget: 1. Tap and hold an empty space on a Home Screen canvas. 2. Tap the Widgets tab at the bottom of the screen to display the widget choices. 3. Swipe left or right through the widget choices, then tap Power Control. 4. Tap the screen to exit the Widget menu. Turning the Phone On and Off Turning the phone on Press and hold the Power/Lock Key for a couple of seconds until the screen turns on. Turning the phone off 1. Press and hold the Power/Lock Key until the Phone options menu appears. 2. Tap Power off. 3. Tap the OK icon to confirm that you want to turn off the phone. Restarting the phone 1. Press and hold the Power/Lock Key until the Phone options menu appears. 2. Tap Power off and restart. 3. Tap the OK icon to confirm that you want to restart the phone. 20 18 The Basics To unlock the phone If you don t use the phone for a while, the screen and backlight will turn off to conserve battery power. To unlock the phone: 1. Press the Power/Lock Key. Your Lock screen will appear. 2. Swipe the screen in any direction to unlock the default Lock screen. To use a shortcut, swipe the icon in any direction. The screen will unlock and launch the application. NOTES The default Lock screen simply locks the screen to prevent unintentional actions. For more security to guard against unauthorized use, you can an unlock requirement (such as a pattern, PIN, password, or face recognition) that will need to be entered to unlock it. Different clock themes can be applied to the lock screen. About Lock Screen Improvement Notification Viewing from Lock Screen From the lock screen simply slide the Notification Bar down to see the latest notifications, all in one step. 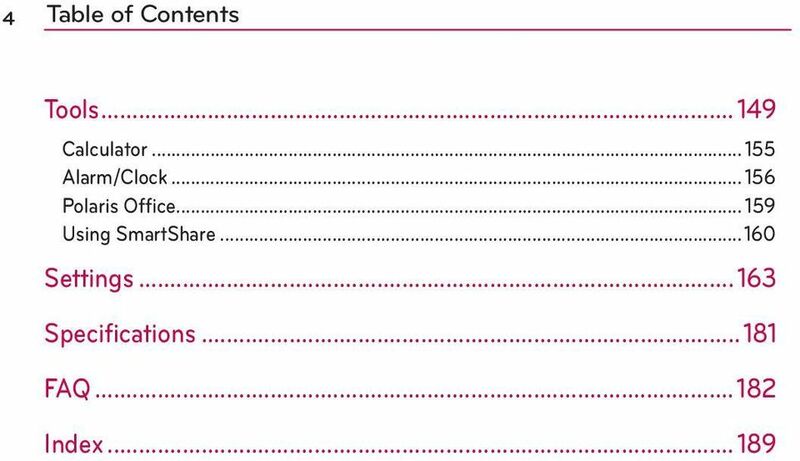 See page 36 for the reference. 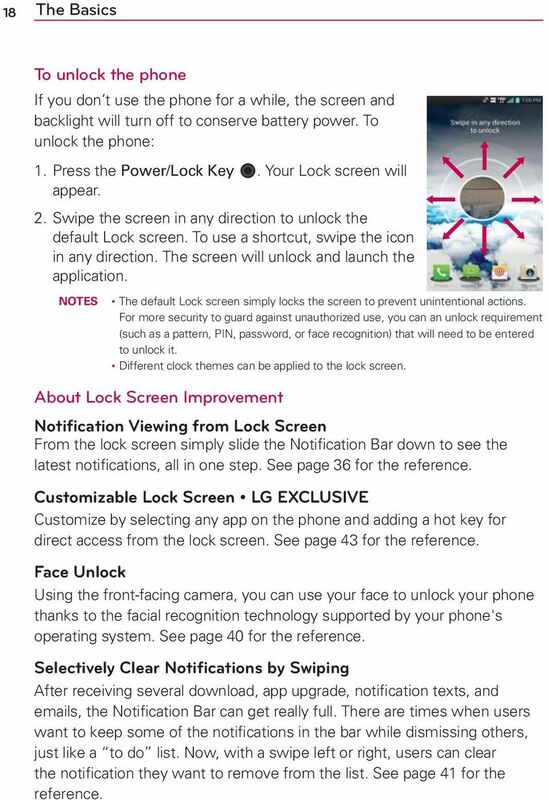 Customize by selecting any app on the phone and adding a hot key for direct access from the lock screen. See page 43 for the reference. Using the front-facing camera, you can use your face to unlock your phone thanks to the facial recognition technology supported by your phone's operating system. See page 40 for the reference. Selectively Clear Notifications by Swiping After receiving several download, app upgrade, notification texts, and s, the Notification Bar can get really full. There are times when users want to keep some of the notifications in the bar while dismissing others, just like a to do list. Now, with a swipe left or right, users can clear the notification they want to remove from the list. See page 41 for the reference. 21 The Basics 19 To turn the phone sounds off If you re in a place where your phone sounds may disturb others, you can quickly silence your phone from the Home screen. 1. Press and hold the Power/Lock Key until the Phone options menu appears. 2. Tap the Silent mode icon. NOTE Only one mode can be selected at a time. The currently activated mode (Silent, Vibration, or Sounds) is underlined in blue. Tap any of the sounds mode icons to switch to that mode. OR Press the down Volume Key on the left side of the phone until all sounds are turned off. 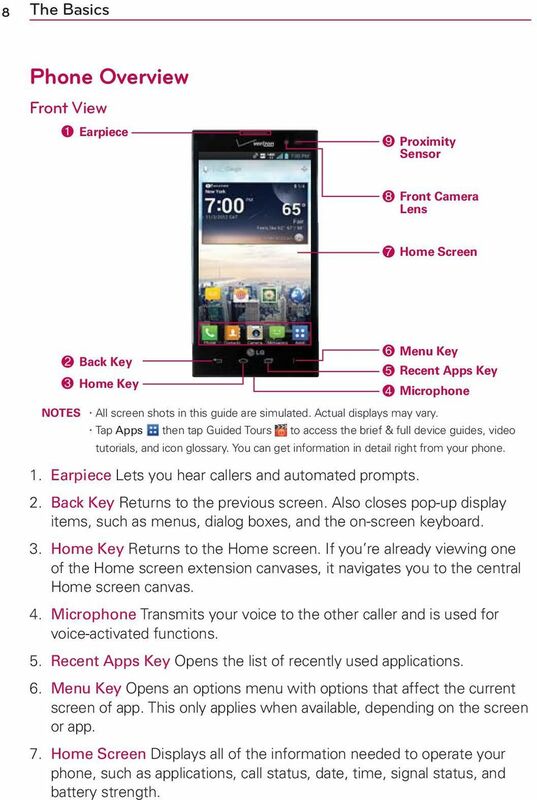 NOTE You can also use these keys to quickly turn the phone sounds back on. Press and hold the Power/Lock Key, then tap either the Vibrate mode icon or the Sounds mode icon. While in Silent mode, press the up Volume Key once to activate Vibration mode and twice to turn on phone sounds (continue pressing to increase volume). Follow the onscreen instructions to quickly set up your phone and accounts. To set up your device, follow the steps below: 1. Select your language and tap the Next icon. 2. If you've already inserted the SIM card, the device will automatically be activated. Tap Start the Setup Wizard to continue. 3. On the Welcome screen, tap the Next icon to set up your device. 4. Tap the Start icon to set up the Backup Assistant Plus application. Or, tap the Skip icon to set it up later. 5. Choose the type of account you want to set up and configure it. 6. Read the Privacy caution and tap the Next icon. Then set your Location settings (VZW Location Services/ Standalone GPS Services/ Google Location Services) and tap the Next icon. 7. The Verizon setup is complete. Touch Next to continue. 23 The Basics 21 Your Google Account You must sign into a Google Account to use Gmail, Google Talk, Google Calendar, and other Google Applications; to download applications from the Play Store; to back up your settings to Google servers; and to take advantage of other Google services on your phone. IMPORTANT If you don t have a Google Account, you re prompted to create one. If you have an enterprise account through your company or other organization, your IT department may have special instructions on how to sign into that account. When you sign in, you re prompted to enter your username and password using the onscreen keyboard. When you sign in, your contacts, Gmail messages, Calendar events, and other information from these applications and services on the web are synchronized with your phone. If you don t sign into a Google Account during setup, you are prompted to sign in or to create a Google Account the first time you start an application that requires one, such as Gmail or Play Store. 26 24 The Basics Getting to Know the Home Screen The Home screen is your starting point to access all of the features on your phone. It displays application shortcuts, icons, widgets, and other features. Status Bar Shows device status information, including the time, signal strength, battery status, and notification icons. Application Icon Tap an icon (application, widget, folder, etc.) to open the application and use it. Quick Keys Provide easy, one-tap access to the phone functions used most often. Add Icon Tap to add icons and widgets to the Home screen. Tap the Back Key to return to the normal Home screen view. Quick Keys The Quick Keys are located at the bottom of the Home screen. TIP : Opens the Phone application which displays a dialpad so you can dial an unsaved number. You can also make calls using your Call logs, Contacts, and Favorites by tapping the tabs across the top of the screen. From the Phone application, tap the Favorites tab to access a quick list of your frequently called contacts. : Opens the Contacts application and displays your Contacts list. You can also access your Groups and your Favorites list by tapping the tabs across the top of the screen. : Opens the Camera application which allows you to take pictures and record videos using your phone. : Opens the Messaging application. You can send text messages or multimedia messages, which can contain pictures, videos, audio, maps of your location, slideshows, and vcard files. : Opens the Applications screen which displays phone options and applications. You can also access your list of downloaded files and a list of available widgets by tapping the tabs across the top of the screen. Apple Device Android Device Download itwinklelight App. Download itwinkle App. Play Store App Store Operating Instructions Guidebook (Please turn over for Spanish) 1 Follow any provided product Instructions. LG-AS680 LG-AS680 Printed in China P/NO : MFL67362001 (1.0) H Copyright 2011 LG Electronics, Inc. All rights reserved. LG and the LG logo are registered trademarks of LG Group and its related entities.